The price noted above is for a pair of bronze oarlock sockets. 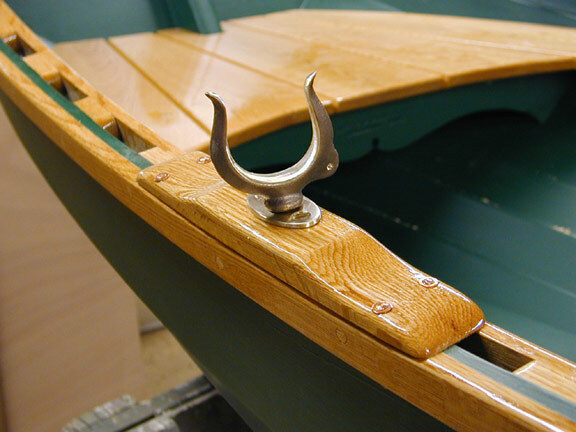 These are matched to our 2" bronze oarlock horns. Our oarlock sockets are unique in that the top plates are elliptical and polished. That doesn't make them better than the typical rectangular top plates, but it does make them stand out and adds a nice finishing touch to the boat you put so much effort into building.The top plate measures 1.345" x 2.500" (give or take)–They vary some during finishing depending on how clean the edge of the cast piece happens to be. These are bored and countersunk for #10 flat head screws. Installation...this happens to be in a Rhodes Wherry.